A damaged house with a fallen tree. 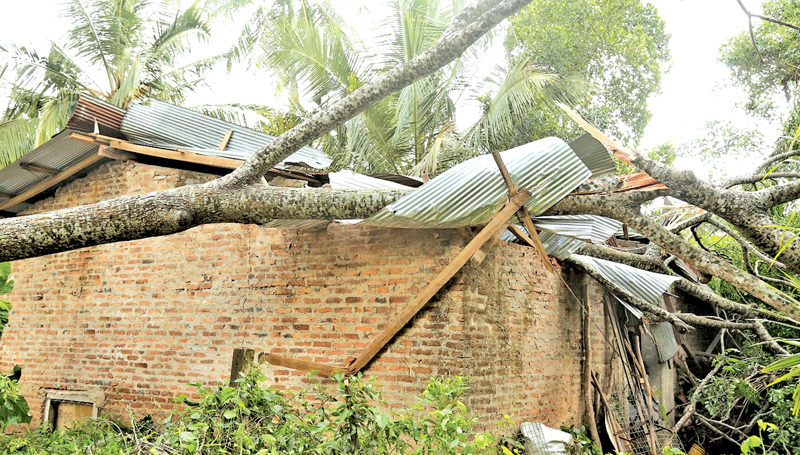 Nearly 100 houses and business premises were damaged in a gale which swept across the Dummalasuriya, Udubaddawa and Bibiladeniya areas around 1 a.m. yesterday (10). Dunakadeniya, Meegahapelessa, Udadeniya and Hevana areas in Bibiladeniya were the worst affected. The electricity supply in these areas were totally disrupted while transport was on many byroads was disrupted with fallen trees and other rubble. Three persons were injured and five vehicles parked inside a garage were damaged with falling trees and branches. H.M. Lakmal, a resident of Bibiladeniya said a loud echo accompanied the gale which swept away the roof of his shop. He repairs computers in his shop and conducts a computer class. About 50 computers in the shop were damaged beyond repair causing him a loss of nearly Rs. 1 million. Sumith Prasanna, a resident of Meegahapelessa, saw several trees uprooting when he looked out of the window to view what was happening. He quickly woke up his mother and ran out with her. The moment they left, tiles in the house got blown off and several uprooted trees crushed their house. Officials attached to the Udabaddewa Pradesheeya Sabha, Divisional Secretariat and the Dummalasuriya Police visited the area to provide relief to the affected. Udabaddawa Pradesheeya Sabha Chairman Raj Sisira Kumara was touring the area to supervise road clearing and other relief work. He said that about 106 houses and shops were damaged.